Here is the new look of NUNTIA! I hope you like it and I hope this is the first change in a series of improvements that the Communication Office intends to make in 2019. 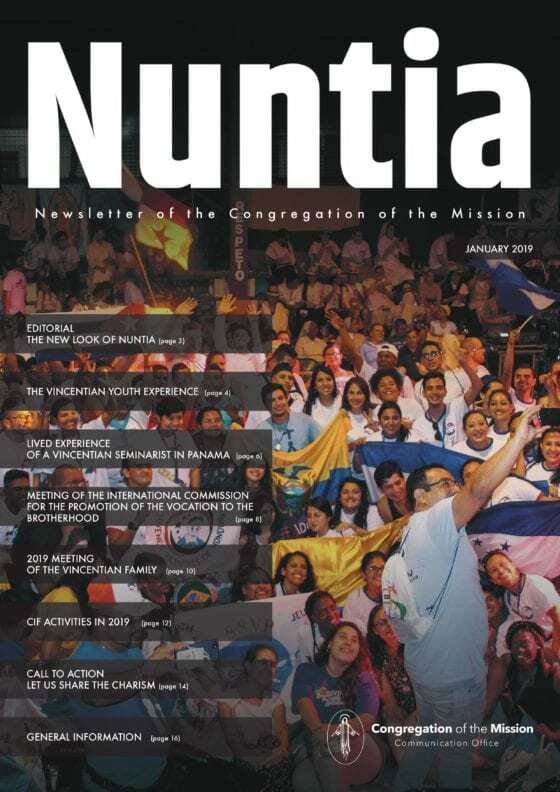 As you know, NUNTIAis a service developed to keep alive the connection among the various confreres scattered around the world, the Superior General, his Council, and the Curia. Although many of the articles you find in the various issues already have appeared on our official website, this monthly newsletter is the printable version of the above-mentioned articles. For this reason we have invested in the graphic design, making it more pleasant and functional, to be read on devices and with the option of being printed. Therefore, we invite you to spread it among the missionaries, but, above all, we invite you to evaluate the possibility of collaborating with us to enrich it more and more, because if the format is the responsibility of the Communication Office, the content is you and your stories at the service of the Congregation! En nombre de la fundación Aguapaneleros de la Noche Laicos Vicentinos, reciban un saludo Fraterno.